The cast of Phantom in rehearsal in FSSA’s Black Box Theatre. 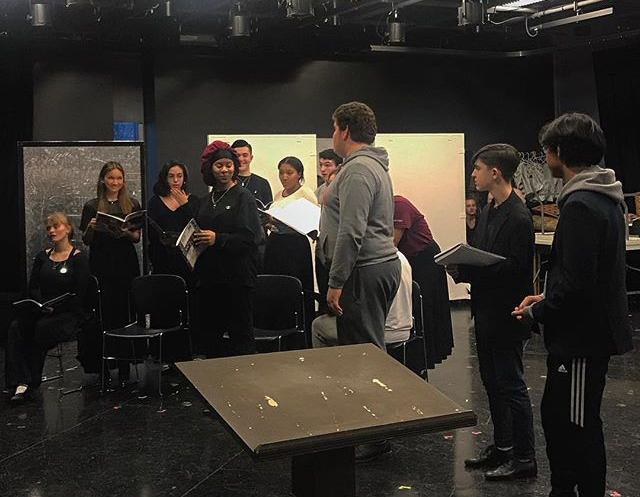 Every year, Frank Sinatra School of the Arts (FSSA) showcases a new musical production and currently the students of the musical theater program are working on The Phantom of the Opera. Behind all the glitz and glamour, the cast consists of passionate students who are pursuing their dreams and who are putting their time and talent into the production. Being in the musical production for his first year, Sophomore Vocal Major, Giancarlo Cascarino, found himself and his abilities of singing, dancing and acting to have grown so much in the span of almost seven months. “For me, the process of the show has been an amazing experience from day one all the way to now and I never thought of how far I would make it especially growing into a performer I’ve always hoped I would be,” Giancarlo stated. The two different casts each have a different way of getting mentally and physically prepared for their rehearsals to better execute their performance for opening night and to see the performance through for the duration. Junior Drama Major, Aidan J .Lawrence, who plays the role of Raoul Vicomte De Chagny uses his own personal experiences to connect to his characters emotions and experiences. “Playing Raoul the past few months has been a privilege. In my opinion, the show is ultimately about love, and loss. That’s what makes the show so incredible. Everyone has been through these two emotions in their life. I know I have. I’ve cared for people and felt the joy that, that has had on my life, but I’ve also felt the pain that it carries as well,” Aidan stated. Prior to this season, only sophomores through juniors were eligible to audition to be cast in the musical every year. However, Director Jamie Cacciola-Price and Musical Director Heidi Best decided to allow current freshmen to audition, which has never been done before. Freshman Vocal Major, Mateo Lizcano, was fortunate enough to be casted as one of the leads, Raoul Vicomte de Chagny. Mateo wasn’t originally going to audition for the musical because he wanted to adjust to high school first and then wait a year to do it, but Ms. Best asked him to audition and this opportunity allowed Mateo to be introduced to a place where he can call a home away from home where he can do what he loves every day. Behind every production, there are the intellectual minds that play a crucial part of every live performance: The Stage Crew. Stage Craft consists of students helping to bring the artists to life, which is musical director, Jamie Cacciola- Price’s, imagination and dreams to an audience. Senior Film Major, Joseph Rana, has been in Stage Craft for two years now and is very eager to seethe whole thing put together for everyone to see. “The chandelier is the most important part of the show and probably the most difficult part of the show due to making sure the protection of the cast and the audience,but it’s also going to be one of the most mesmerizing pieces of the show, which I am really excited about,” Joseph said. The cast has spent more than seven months together rehearsing and preparing to perfect the production to the best of its abilities. Senior Vocal Major, Martina Coronel, who has been in the musical theater production for three years now enjoys being able to participate in a different musical every year with a different cast, which has allowed her to get closer to her peers. “Since we spend so much time together, we developed a stronger bond, it’s almost family-like and as you get closer and closer, it’s a home away from home,” she said. The Phantom of the Opera will be performed at FSSA’s Tony Bennett Concert Hall on March 8th and 9th as well as on March 15th and 16th. ← Are We Too Worried About College?